Welcome to Calx Mariae, Voice of the Family’s quarterly magazine! Calx Mariae seeks to contribute to the rebuilding of Christian civilisation by providing essential coverage and analysis in the areas of life, family and culture. Our aim in producing this magazine is to strengthen our supporters in the faith and in their witness to the truth about human life and the family. 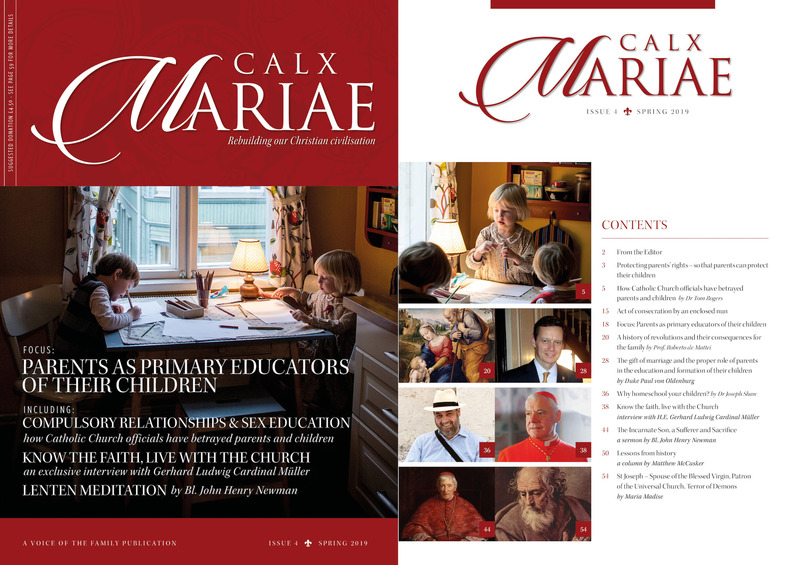 Issues of Calx Mariae are published in March (Spring), June (Summer), September (Autumn) and December (Winter). If you are interested in receiving Calx Mariae or in supporting our work. Please contact us if you would like your copies of Calx Mariae delivered elsewhere. Our magazine’s name, Calx Mariae, means ‘heel of Mary’. In the book of Genesis we read that, after the fall of Adam, God said to the serpent “I will put enmities between thee and the woman, and thy seed and her seed; she shall crush thy head, and thou shalt lie in wait for her heel” (Gen 3:15). In the body of Christ, the Church, we could perhaps think of lay people as the heel. Every member of the Church has their proper place and function, each must fulfil their proper role if the body is to be healthy: the pope as head, the cardinals and bishops subject to him; priests subject to their bishops; religious to their superiors; and finally lay people to their shepherds. In our time this divinely established order is tragically disturbed in countless ways. The failure of many in authority to faithfully transmit the Catholic doctrine means that it is often left to the laity to defend and proclaim the faith, and the basic truths about human life and the family, in the public square. That being the case, we should not let this be a source of distress or pride, but faithfully serve to the best of our ability – as the heel of the body of Christ. In conducting our combat for life and the family we must stay close to Our Heavenly Mother. This is what filial love and duty commands, and also what common sense demands – she is the one who will crush Satan’s head. “The final battle between the Lord and the reign of Satan will be over marriage and the family” wrote Sr. Lucia, one of the three shepherd children to whom Our Lady appeared in Fatima. Of course we cannot know how long a final battle will go on before it reaches its final stage, but we do know that the sanctuary of human life – namely the family based on marriage – is the ground for a decisive battle. We also see with increasing clarity that this battleground is inseparable from the combat for the faith in the Church that we love. As Christians we are always called to be witnesses to the truth, but this call has a particular urgency today. Our fight for natural goods, for the right to life and the wellbeing of the family, can only be fruitful if we acknowledge and affirm the rights of Christ, the Author of Life. As a movement for life and the family we are committed to defend the sanctity of human life, but as Catholics we are also called to defend the reverence and adoration due to the Divine Life in the Holy Eucharist. It is our hope that Calx Mariae, brought to you a few times a year, will offer you some sustenance for the battle, inspire ever greater love of God and faithful service of His Church. In the end the Immaculate Heart will triumph. We only need to fulfil our role in the battle. Knowing this should make us confident soldiers, who remain always close to their Mother and Queen. “It is my pleasure to welcome Voice of the Family’s magazine, Calx Mariae. Its title, with its allusion to the protoevangelium (Gen 3:15), should remind us that the Holy Virgin’s victory over our ancient enemy is already assured. I hope that its presentation of the beauty of Catholic teaching will contribute to the rebuilding of Christian civilisation. I pray that its content will help all those who read it to draw ever closer to our Blessed Mother at this time of trial for the Church – like St John, those who remain close to her will not abandon the Lord. – Bishop Athanasius Schneider O.R.C.